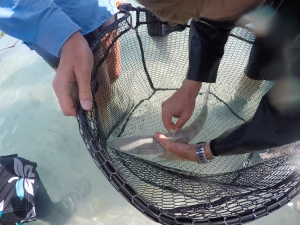 Dr. Owen O’Shea releases an adult bonefish. In collaboration with the Fisheries Conservation Foundation (FCF) and the Florida Fish and Wildlife Conservation Commission (FWC), the Cape Eleuthera Institute (CEI) sent researchers to the Exuma Cays in February to tag and collect genetic samples from bonefish (Albula vulpes) and southern stingrays (Dasyatis americana). The CEI team was comprised of Director Aaron Shultz, Associate Researcher Dr. Owen O’Shea, Research Assistant Alexio Brown, Flats Ecology intern Georgie Burruss, and Sustainable Fisheries intern Adrian Feiler. They were joined by FWC Post-doctoral research fellow Dr. Liz Wallace, and a North Carolina based volunteer and avid fisherman, Chandler White. The researchers spent eight days on Hummingbird Cay, a privately owned island south west of Great Exuma, and two days at the Exuma Foundation on Great Exuma. Adrian Feiler tags a bonefish with a uniquely coded spaghetti tag. 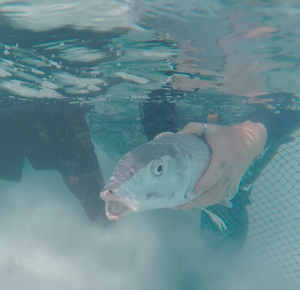 The focus of the trip was to continue the Bahamas Tagging Initiative in Exuma, which aims to passively track bonefish movement and growth rates throughout the Bahamas. Each fish is tagged with uniquely coded external ‘spaghetti’ and the length of each fish is recorded. This allows the assessment of growth rates and location data once the fish are re-caught. These data can then be used as a powerful tool in understanding the mechanisms of spatial distribution, natural mortality, and factors influencing growth of this highly prized sportfish. The tagging program has been implemented in Eleuthera, Grand Bahama, Abaco, Andros, and the Exuma Cays. During the tagging event, a small section of the dorsal or caudal fin is taken from each fish to obtain DNA for genetic testing. These fin clips are analysed by Dr. Liz Wallace to determine population connectivity and genetic diversity among bonefish within The Bahamas and wider Caribbean bioregion. Dr. Wallace’s research focuses on conservation efforts, such as in the Florida Keys, where the bonefish population has been in decline over the last few decades. Her research, in collaboration with Christopher Haak (FCF) and supported by Bonefish and Tarpon Trust (BTT), aims to elucidate whether local bonefish populations are self-sustaining or are supported by larvae recruited from other areas in the Caribbean. If local populations are supported by external recruitment, conservation efforts will need a broader focus including protecting bonefish in the areas that are supplying the local fishery. The research team in collaboration with local bonefish guides (Stevie Ferguson, Reno Rolle, Drexelle Rolle, JJ Dames, and Garth Rolle) successfully tagged 254 bonefish and collected fin clips from each. Bonefish were sampled on the West side and North end of Great Exuma, near Hummingbird Cay, and a few fish were also sampled near Moriah Harbor Cay. Guides and anglers should be on the lookout for tagged bonefish and should report tag numbers, fork length, location, and date to BTT (by phone: 321-674-7758 or email: info@bonefishtarpontrust.org). Overall, this was a very successful trip that would not have been possible without the support of the guides and conservation organizations in Exuma. The team were also able to sample southern stingrays and collected morphometric data and genetic samples for the CEI Southern Stingray Research Project initiated by Dr. Owen O’Shea. Stingrays are considered critical to ecosystem function, altering it physically with their feeding behavior and controlling invertebrate prey populations. This species is considered data deficient, so this research aims to gather data on their life history, movement patterns, site fidelity, seasonality, and habitat use. 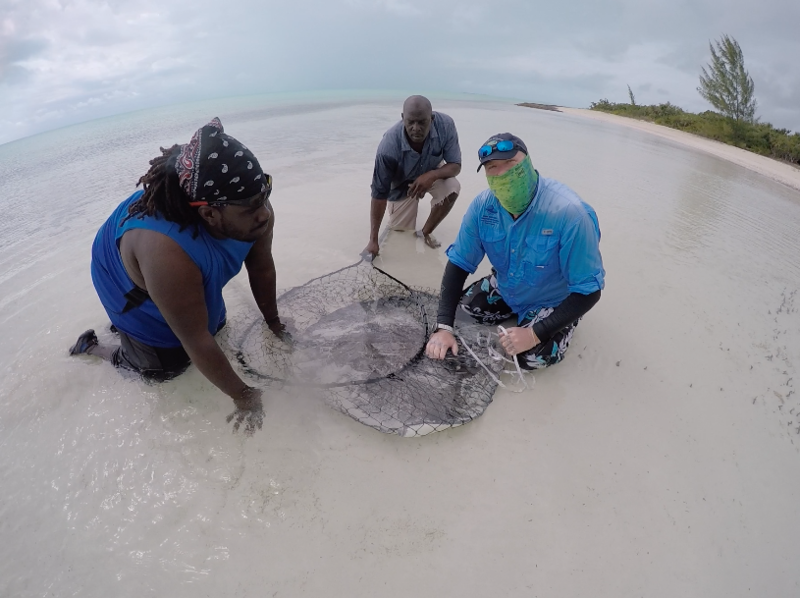 The data collected from these rays will be used to determine genetic connectivity with other populations currently being sampled around The Bahamas, and will provide insight into how habitat fragmentation and degradation is impacting the genetic diversity and spread of this important fish. During their stay at the Exuma Foundation, the team met with bonefish guides and members of the Exuma community working to expand the Moriah Harbor Cay National Park. Catherine Booker, educational instructor at the Exuma Foundation, is rallying support for the protection of key mangrove areas, which act as nurseries for many fish as well as settling ground for Caribbean spiny lobster (Panulirus argus) larvae. The team was able to spend a day tagging bonefish in this proposed addition to the Moriah Harbor Cay National Park. The area contained many mangrove creeks and large flats; habitats that are essential for bonefish as well as provide protection from predators for many juvenile organisms. Currently, this area is under threat of development, which would destroy this diverse habitat, critical for so many organisms. 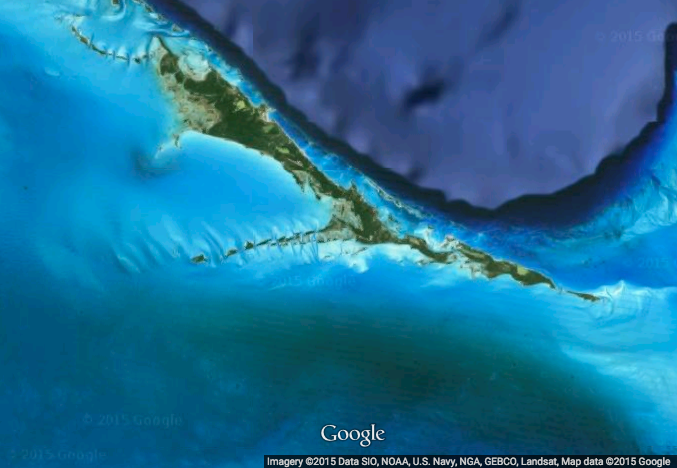 Hopefully community support, scientific evidence, and rapid ecological assessments conducted by the Bahamas National Trust will provide the necessary information to expand the Moriah Harbor Cay National Park into these critical habitats. Financial support was provided the Cape Eleuthera Foundation, Bonefish and Tarpon Trust, and Hummingbird Cay Foundation. For more information and a small video of this trip please see https://www.youtube.com/watch?v=IddkcRxsrGk.